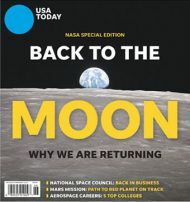 USA Today recently published a 96-page NASA special edition titled ‘Back to The Moon: Why Are We Returning.’ Among other articles of interest, it covered 100 years of innovation at NASA Langley, NASA’s trending ambitions, and the new space race. Bomas Machine Specialties, Inc. of Somerville, MA joined leading universities and some of the nation’s top providers of research and development products, services, and technologies to the space industry, with advertising support in the special tribute. Bomas provides precision machining of advanced ceramics and composite materials to space, military/defense, automotive, dental/medical, nuclear, solar/wind industries, and research universities.